“Until we find them.” These are the words of determination, sorrow and love repeated time and again by relatives and friends of people who have been disappeared - those who were forcibly taken from their homes, a work place, a crowded bus or an empty street, often because of their presumed beliefs, whose capture is denied by the authorities or the forces that took them, with their whereabouts and fate sealed in silence for years, or sometimes forever. “Finding them,” however, is a vow that mobilizes and echoes across generations and geographies. Over the past decades, the search for the disappeared has been carried forward in many countries, always as a humanitarian effort and often as a driving force in the political struggle for justice. “Finding them” carries not only the thread of hope that a loved one may be returned or appear alive, but also very importantly the demand for acknowledgement of the crime and for full information about the circumstances of the disappearance, who was responsible, the fate of the person, and the whereabouts of their remains. It means the return of the remains to their families so the appropriate rites to attend the dead, whatever these be, may be carried out. And for many, it also means holding the perpetrators to account. In a number of countries where governments have refused to provide information or undertake this search in an effective manner, civil society groups have developed highly professional skills to locate clandestine gravesites, exhume remains, conduct forensic analysis to establish their identity and the circumstances or cause of death, and return the remains in a dignified and culturally sensitive way to the families. Work by such forensic anthropology groups, for example in Argentina, Guatemala, Peru, and Bosnia, has allowed thousands of families to recover the remains of their loved ones. And their work has cracked the silence and denial about disappearances by providing hard evidence regarding how the deaths occurred. In some cases, their findings have formed the basis of successful criminal cases to bring the perpetrators of this terrible crime to justice. Today as part of transitional justice and peacebuilding processes in several countries, we are observing a trend that is emerging as the result of strong and sustained advocacy efforts by victims groups and civil society actors. Governments are agreeing to establish special entities, with fairly robust mandates, to search for the disappeared in parallel to the work of truth commissions and the courts. All face a number of challenges, including the very complex issue of the how and when the forensic findings of the search commissions may or may not be used by the courts. Nepal, Colombia and Sri Lanka are in various stages of establishing such bodies. In Nepal, the special commission has been working for a number of months and has received almost 3,000 denunciations. In Sri Lanka, where there are tens of thousands who have been reported as disappeared, the commission still only exists on paper. In Colombia, after reaching a historic peace agreement just some days ago, the country will have a chance to address the shortages of its past attempts to deal with enforced disappearances by creating a special search unit. The challenge now in all cases is to move from the very important, formal commitment to effective and timely results. The needs of the families of the disappeared as they themselves articulate them, their participation, their dignity and the dignity of their disappeared love ones, must be the guiding framework for these new initiatives. The governments involved not only have the opportunity to reflect their commitment to the rights of victims through these efforts, but also, by doing the job well, to begin to build trust with citizens who have suffered a most horrendous crime. 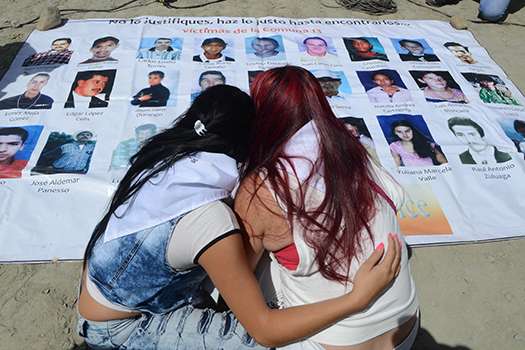 On International Day of the Victims of Enforced Disappearances, we spotlight this struggle for truth and justice about the disappeared in Nepal and Colombia. Disappearances were a central part of internal conflict in both countries, and peace processes have since established a framework to address the needs of the victims. In Nepal, a 2006 peace accord laid the groundwork for an investigative body, but ten years later families of the disappeared are still waiting for answers. Is there political will to provide them? In Colombia, the new peace agreement includes mechanisms to find the disappeared, but it is not the first time a body has set out to search for Colombia’s disappeared. How can the country avoid the mistakes of the past and work closely with victims, who have been leading the search for decades? At two radically different points in their respective peace processes, join us as we explore what victims want from official investigations in Nepal and Colombia this International Day of the Disappeared.